Hailsham Town manager Jamie Salvidge has admitted he can’t shake the feeling of ‘what-if?’ as his side prepare to host lowly Billingshurst tomorrow (Saturday, 3pm) at the Beaconsfield. The Stringers, who now sit ninth but still with games in hand over the sides around them, have recruited well in recent weeks and Salvidge’s new look side have now won five of their last six games and three on the bounce after dispatching AFC Varndeanians 3-1 this past Saturday before putting six past Southwick last Tuesday evening. “I must admit every three points that we notch up on the board now, makes it feel a little bit worse to be completely honest with you,” said Salvidge. A first half Danny Leach hat-trick was enough to seal all three points against AFC Varndeanians at the Beaconsfield despite a late consolation with 15 minutes remaining. Leach then made it back to back hat-tricks against Southwick with Joey Pout chipping in with two goals and a late goal from substitute Casey Ham rounding off the impressive win. Salvidge put the bucket load of goals in recent games down to a switch in formation combined with his new ability to name an unchanged squad in successive games. “We have switched to a 4-4-2 system over the last few weeks and it really suits our style,” said Salvidge. “We have got goals in the side all the way through midfield and up top, the two strikers are both on fire, particularly Danny (Leach). “The pleasing thing about last night was that Joey (Pout) chipped in with a couple of goals, he was playing centre back and it was good to see goals throughout the whole team. “We’ve also got goals coming from the bench as well. Casey Ham especially has come on in the last couple of games and made a real difference. “I think the benefit of the last few weeks is that I have been able to name an unchanged squad for the first time. “I have not been able to do that all season so to be able to do that at this stage of the season can only be a good thing. Salvidge also spoke of increased interest from prospective new players in light of his sides recent upturn in form. “It is interesting that now that we have some recognisably good players and we are doing well and climbing the league, my phone has been going crazy from people that want to join and come and see what we are doing,” said Salvidge. “It is a good feeling, because it definitely wasn’t that way at the beginning of the season. “At the moment I am quite happy with the squad that I have got. We have a nice tight knit group at the moment and so it is going to have to be, particularly for the rest of this season, someone that can add to the quality that we already have rather than becoming a squad player. Salvidge says his focus is now on building for next season, without disregarding the remainder of the current one. “We are building towards next year and so that feel good feeling has got to carry through right the way from now to the end of the season, and then we’ll start again next year with completely different objectives to this years,” said Salvidge. “My job is to get a team out onto the pitch and recruit a side that is good enough to get out of this division. “The focus is on getting the squad together for next season and giving promotion a real go. “That is not to say that we are putting this season to bed without any commitment. “We are completely set on picking up wins between now and then and we have got about ten games left, with a good proportion of those at home, so that is good motivation for everyone. “Realistically, a top six finish would be quite satisfying from where we were in mid-November. Salvidge also plans to use two of his sides remaining games as a gauge for the Stringers potential next season. 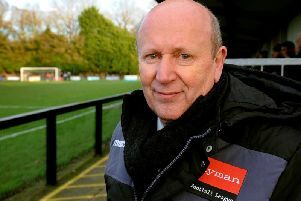 “There are teams that are well established in this league and have used the last few years to prepare their squads for promotion and I am talking specifically about Little Common, Langney Wanderers and Lingfield,” said Salvidge. “They are all teams that have been in this league a while and I think looking at the league, they will be the three to get promoted. “They have certainly been the best three sides that we have come across this year. “A top-six finish would be a good achievement but again, with the run we’ve been on as of late, it is a stick in the throat that we haven’t had this squad and the consistency since the beginning of the season because I don’t think they’re much better than us now. “However, we have opportunities to play Langney and Lingfield between now and the end of the season.